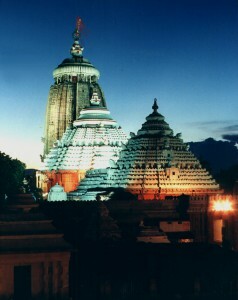 The Puri temple is built on a gigantic raised platform in the heart of the city, The temple complex is enclosed by a wall abou t seven meters high -including the 0 height of the platform. The area of this platform is more than 4,20,000 sq.ft. The wall is pierced by four gates ,facing the four directions. On the east-facing gate, there are stone images of two lions and it is called the Lions Gate. The north, south and west facing gates are similarly known as the Elephant Gate, the Horse Gate and the Tiger Gate (also called the Khanja Gate) respectively. The north gate is mainly meant for the God himself in as much as, the logs of wood out of which, the images are fabricated, make their entry into the temple premises through this gate, when the Navakelevara ceremony takes place. The east-facing Lions Gate is the main gate. There are pyramidal structures over the four gates, which are not very old. As we cross the main entrance on the east and ascend the flight of steps leading to the main temple, we find on the left-hand side, a vast kitchen area of the temple. Some tourists rightly observe that on account of this kitchen, the Puri temple may be described as the biggest hotel of the world. It can feed even one lakh persons with only two to three hours’ notice. The method of preparation is most hygienic and the traditional process of preparation of food for so many people in so short a time, takes many by surprise. To the right, we have the Ananda Bajara which is the popular name of the food selling market within the enclosure. Ananda Bajara literally means, the pleasure market.